Welcome to the Florida Family Consignment LLC website, Volusia and Seminole counties one-stop shopping extravaganza. 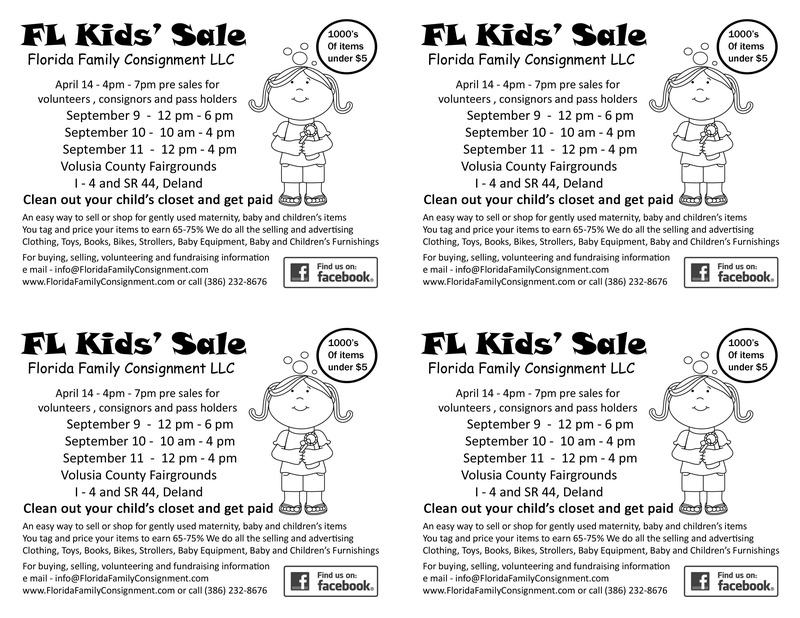 Florida Kid's Sale is a seasonal children's consignment event specializing in the highest quality new and gently-loved infant's, children's and maternity clothing, toys, books, games, DVDs, baby equipment (strollers, swings, etc.) and baby & child furnishings. Throughout the United States seasonal consignment sales are becoming increasingly popular shopping events. Consignment sales offer an easy way for families to earn some extra income by recycling and reselling their gently-used items. Shopping at our sale is a great way to stretch the family budget while buying name brand merchandise at a fraction of the original price. Clean out your children’s closets and get paid! We provide a safe avenue to sell your gently-used items. With our sale you tag and price your own items and we do all the rest earning you 65%-75% of the sale price. We do the advertising; we do the selling while you sit back wait for the check. Having multiple sellers means more shoppers and better prices. We only accept gently-used and new items. Everyone can consign, volunteer and shop. We love our volunteers, and to thank them, volunteers get to shop first at their own pre-sale shopping event. We invite you to join us and look forward to seeing you at the sale! Click HERE to sign up for our mailing list for future sales. A wonderful part of our event is our new and Expectant Mom pre sale. Any mom expecting their first child or the mom of a baby under 1 year old can register HERE to attend this event. Each Mom may bring one guest.